Oh yes, absolutely thrilled here! Do try on black. 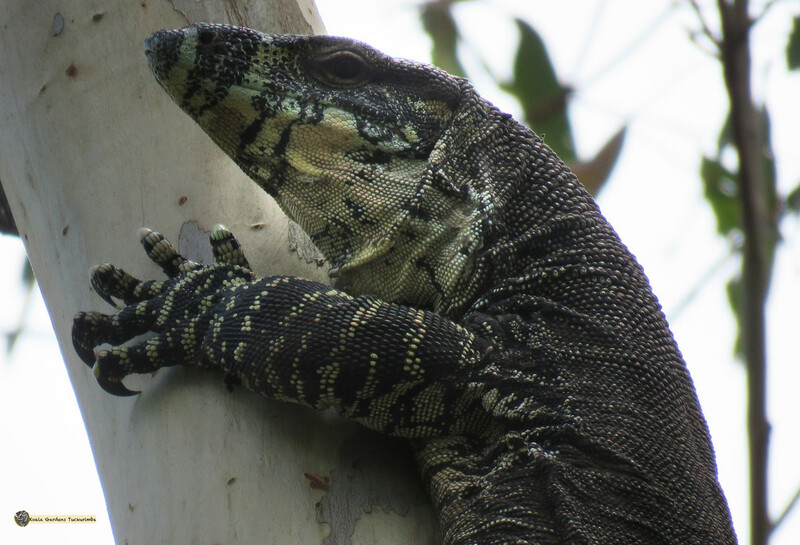 The first time I have seen a lace monitor on the property (goanna). He was a good 1.5 metres, and I do have other photos that show how broad he is, but he was about the size of me to give an idea. Yep another arboreal animal, and the koalas would be impressed with those claws. I was off the bike in a flash and following as he went up the tree to try and get the best angle for a good shot, pity he went so high so fast as it was hard to get a good one that showed his full body well, but his face is worth a close look anyway. I would be thrilled if I could see one of these every day, they are just so stunning! Thanks so much for commenting and being part of the many discoveries on my bit of paradise. huge goanna and I won't want to be bitten by one ! So many interesting reptiles! I have my yearly outing in February/March to look for adders coming out of their nests after hibernation and that's it! Great shot. Wow, this is amazing, and he sounds huge! Well done for getting that capture. He’s HUGE. How fantastic and exciting for you. Brilliant capture. Thank you for sharing. Definite fav. What a superb specimen! Great detail. He is magnificent! You are surrounded by amazing creatures! he is just beautiful. great shot, lots of birds nests around? Great close up . You have a beautiful wild life in you country. Wow, that's one big lizard. :-) Great capture. He's so lovely! Great patterns. I agree with Pyrrhula- you have such amazing creatures! I would not want to meet up with his claws! Stunning, yes - but more than slightly alarming too!